After receiving many questions as to where to find Comet Lulin, I've made up a finder chart to share with you all. 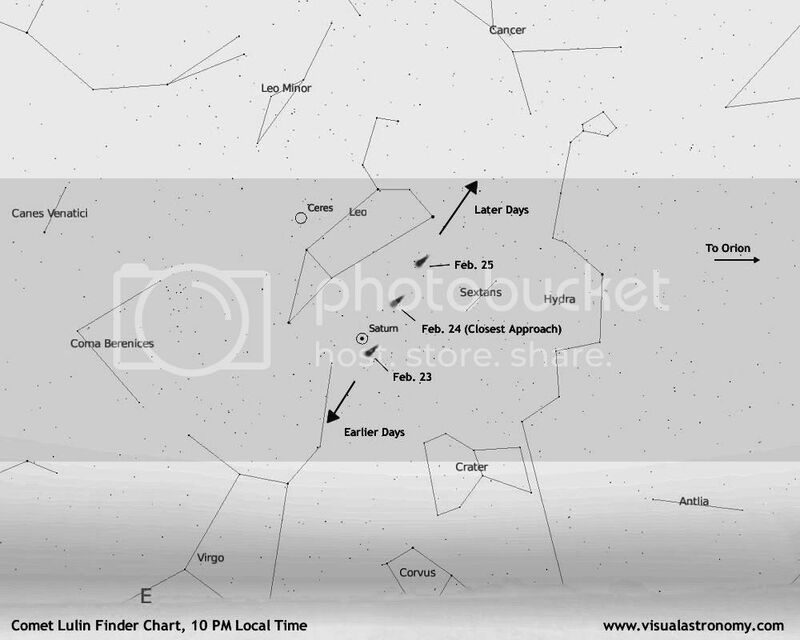 This chart shows the comet's position on February 23rd, 24th, and 25th. It also includes the general path the comet will take after its closest approach on February 24th. To orient yourself to this finder chart, go outside and look East. Find the sickle shaped asterism seen in the chart as the right side of Leo. 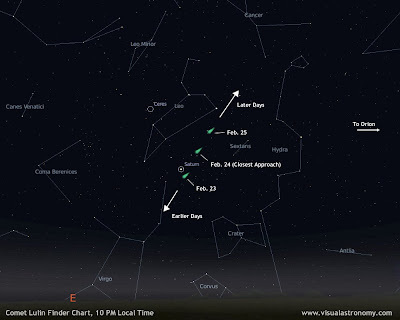 Now you can use the chart to find Comet Lulin. Click here for a more printer-friendly chart. I was hoping to show the Cub pack Tuesday but the forecast is overcast. I'll be looking tonight. Thankfully, Saturn is now up in the evening. I like tacos. Has anyone had a comet taco party? I'm thinking of having one but dont what kind of salsa to use on my moon tacos? Any suggestions? On Oahu, which direction should I be looking? The finder map above is for locations near 40* N latitude. The longitude of the location doesn't matter as much. So even on Oahu, the finder map is quite accurate around 10 PM local time. No luck - I've got Saturn, but I'm not seeing anything near Saturn with binoculars nor with my lx90 with 40mm, 26mm or 13mm. What am I doing wrong? Watching from Kansas City it's 12:30 a.m. and I've been looking for 30 minutes. Hey all Just saw it. Im in central Jersey and spotted it low in the western sky, It was just like they say, didnt have a telescope or binoculars. Was green, bright, and flashing green and red, really flashing alot, I could tell is was moving very very slow, I went inside to check the web again and went I went back out it was gone, I think because it got kind of hazzy out, Great sight to see though!! They say you could see it tomorrow too, Ill be looking ! Good luck all !! What is the best time to view this? I live in eastern PA (near Harrisburg). My husband says near sunrise but I've been out two days in a row and nothing. My 11 year old son is disappointed. No luck tried with 11x70s at 10pm and 5am. Found Saturn and one star due W in FOV but light pollution killed all else. The forecast for the next couple of days looks worse. @anonymous(NJ) sorry to disappoint, flashing is a good clue you've seen an aircraft. You would likely need a telescope to see any motion and it would take some time. You might see some green in a good pair of binoculars or a scope. Some photos can be found below (but these are long exposure and more than you'll see by eye). That's some airplane! We live in Virginia and saw the same one in the Western sky! Very bright, seemed to wobble, and remained visible for the 15-20 minutes we were watching after midnight. Perhaps someone has another idea as to what we were seeing? Airplanes always move out of sight within a minute or two. @Charlotte, look SE around 10pm or WSW before dawn. By the 27th the comet should be by Regulus the star at the base of Leo near the arrow that says later days. To the folks in Virginia seeing something in the West after midnight...You were most likely seeing the setting of Sirius (Alpha Canis Majoris) or Rigel (Beta Orionis). Comet Lulin is stll high in the south at midnight. I´m in Mexico city where the atmospheric polution and night lights are a real problem to see details in the sky, but tonight -as a universe gift- the sky is incredible clear and after an hour looking for Lulin finally i found it. In my apreciation it seems similar to orion´s nebulae, very close similar, but Lulin has a lovely green fog while orion´s nebulae is blue (naked eye). I found it helped with a binoculars 12X60. I have a little comercial "Tasco" telescope 60mmX900mm refractor with two eyepieces (12mm and 5mm) and it was enough to observe this beautiful sky show (enjoyable more with wide open eyepiece like 12mm). with my little telescope and wide open eyepiece (12mm) Saturn and Lulin was NOT in the same visual field. (but with binoculars 12X60 you can see them both in the same visual field.) At this time Saturn barely has his "ears" so it´s easy to make the mistake and take him as a star. i liveon the east coast of the uk , can somebody please tell me were to look ?? @Laura, you should try out your scope first. Saturn should be an easy target. You'll need about 35 power or more to see the rings. Don't go too high either - stay to lower powers. If you don't know the power outright, you need to divide the focal length of the scope by the size of the eyepiece. If you have an 800mm long scope and a 20mm eyepiece you have 800/20 = 40 power view. Any idea if this telescope is good or rubbish?! Alls i wanna see is Saturns rings! All I can ever see are Stars. @Laura - I know Viking has a presence in the UK and makes spotting scopes. I don't know if they make astronomical scopes. Spotting scopes can be used for star gazing but may not have a large enough main lense to gather light to see everything you want. Spotting scopes tend to look like 1/2 of a binocular or have a built in bend near the eyepiece, images are upright (unlike many astronomical scopes) and the large lense tends not to be much bigger than a binocular lense. It sounds like you have a 20 to 60 zoom with a 60mm lens. The problem with these is that they have more magnification than they can gather light. Basically at 60x power the light the scope delivers to your eye allows you to see about 1/9th of what you would see at 20x. It's called exit pupil (See http://www.visualastronomy.com/2009/02/effects-of-exit-pupil.html ). I expect that at mid power you should be able to see Saturns rings. The problem about now may not be your scope as Saturn's rings are just about edge on right now (See http://www.visualastronomy.com/2008/11/saturns-rings-nearly-edge-on.html ). I would also expect that you should be able to catch the comet at 20x. Just remember that it's moved west along the path of the Sun from Saturn about 19 degrees (a bit less than the spread between your thumb and small finger when held at arms length). Tonight the comet will be very nearly on top of the bright star Regulus. @Mason - anytime between about 9pm and 5am. 11:30pm EST - spotted it near 27v (nu) Leo just west of Regulus. Cold and Dew cut short observing so I couldn't see motion. With light pollution there wasn't that much to see. Faint and fuzzy. Had a quick look at Saturn at 22x, 66x, and 86x. With the rings edge on they were barely visible at 66x. I'll be doing some quick checks the next few nights with 11x70's. Wednesday it should be on top of the Beehive in the heart of cancer. BTW. With the conditions at the time the tail wasn't visible. I live west of Detroit, MI. I have been seeing a huge bright star/planet in the western sky every night for quite a while, is that Saturn? If it's very bright, it's probably not Saturn. Currently, Saturn's rings are nearly edge-on, so it is not very bright compared to some of the brighter stars in the sky. You may have been seeing Sirius or several other bright stars. What time is this star in the West? Regards in a delightful present. Any page comes with have shown any exertions and additionally feel you've got in that line of business. At this time follow-up Payday Loans I need the software checking.